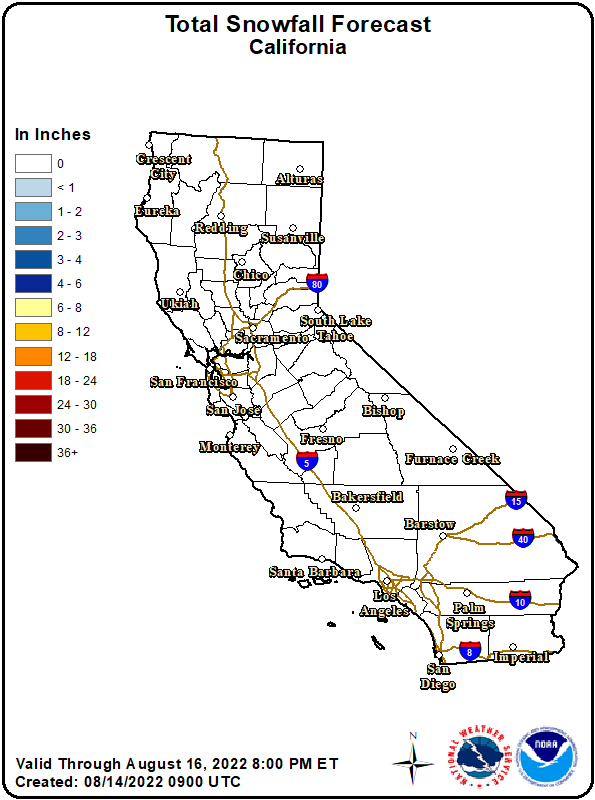 The SLOweather 7 Day Irrigation Index (7DII) is a guideline for how much you might need to be watering turf or lawn in the San Luis Obispo area. It is a running total of the last 7 days of rainfall subtracted from the running total of the last 7 days evapotranspiration or ET, as measured and calculated by the SLOweather weather station. If the 7DII is negative or zero, then you should not need to water your lawn at all, as more rain has fallen than ET has removed from the soil. If it is positive, then that value is how much irrigation water you might need to deliver over the next 7 days. You can measure how much water your sprinklers deliver over a period of time by setting out a few clean, shallow cans, such as tuna or pet food cans, and measuring the depth of the water in them after an irrigation cycle. Divide the average inches of water by the time in decimals of an hour your sprinklers ran, and you'll know how many inches per hour they'll deliver. If you have more than one sprinkler circuit, repeat the above for each one. Figure out how long to water each week. To decide how long to try running your sprinklers in a week, divide the current 7DII by the delivery rate you just calculated. The 7DII is not intended to be referred to every day. Using it to adjust your irrigation timer once a week or even every 2 or 3 weeks should be sufficient, especially during times when there is little change in day-to-day weather pattern. The SLOweather 7DII is a work in progress, and comments are welcome. As our area is currently in a drought, and we have a limited supply of water, I developed it to help get an idea of how much water grass might need based on current and recent weather conditions. I started with a simple running 7-day ET totalization. Then we received a little bit of rain, and I realized that there ought to be a correction to the ET total to compensate for rainfall. The easiest way to do that was to create a running 7-day total of rain as well. Along with the 7-day rain and ET totals, I have included the locally calculated Keetch-Byram Drought Index. Evapotranspiration, or ET, is a calculation based on temperature, wind, relative humidity and solar insolation. It estimates the amount of water lost from the soil from both EVAPOration and plant TRANSPIRATION. The ET model SLOweather uses is for turfgrasses.